Following Modern Times, Chaplin married actress Paulette Goddard. There marriage was generally a happy one and Charlie’s two adolescent sons, Charles Jr. and Sydney, very much looked up to Paulette and accepted her as a maternal figure. As for professional endeavors, Chaplin became aware of the tyranny rising in the Hitler regime and decided to make a politically fused film to elaborate on his ideals and feelings towards what was happening in Europe. This was in 1938, well before either England or America became involved in the war. Hitler, apparently an admirer of Chaplin, wore his mustache in the same manner as Chaplin’s Little Tramp as an homage. Chaplin, however, was very much against the dictatorial rule and awful happenings the Third Reich were performing. When rumor circulated that Chaplin was going to do a film based around his likeness to Hitler, many of his closest friends tried to talk him out of it. 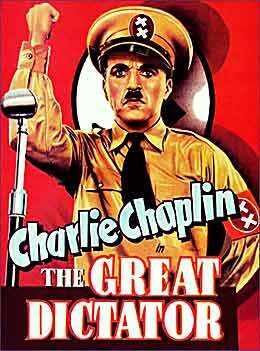 However, he pushed forward with the script and produced what would become The Great Dictator. The film begins in World War I, where a young private (Chaplin) in the Tomanian army valiantly rescues an officer pilot, Schultz. Though Schultz is rescued, the plane they are in crashes into a tree and the anonymous private suffers memory loss. He is taken to a hospital where he remains for nearly 20 years. Upon return, the young private doesn’t realize that things have changed in his beloved Tomania. The dictator, Hynkel (also played by Chaplin), is now the ruler of the country. When the private arrives back in the Ghetto at his barber shop, he finds many storefronts smashed and other forms of discrimination being carried out by Hynkel’s stormtroopers. Yet, the young private tries to go about his work and life as usual and, eventually, finds a friend in a girl of the ghetto, Hannah (Paulette Goddard). Schultz, the young private’s friend and officer, makes his way back into the story around this time as a member of the regime. Immediately recognizing the young private, he orders the stormtroopers to leave his friend alone. As the tyranny of Hynkel grows, he decides to take over neighboring country Osterlich. 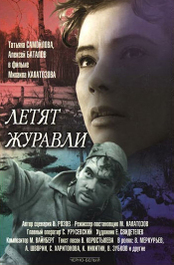 Schultz questions his motives and is condemned to a concentration camp, though he manages to flee the ghetto before being caught. He tries to start a revolution, but before it gets off the ground, both Schultz and the barber are sent to a prison camp. In the meantime, Hannah has fled to Osterlich, only to find it eventually taken over and under Hynkel’s rule as well. While celebrating his victory, Hynkel vacations to the countryside. Meanwhile, Schulz and the barber escape the concentration camp. Because of his likeness to Hynkel, the real Hynkel is arrested and put in a prison camp and the barber is thought to be Hynkel and put in his place of power. Finding himself in this unique position, the barber decides to state his opinions on tyranny and democracy and gives a speech in front of all his people renouncing the ways of tyranny and promoting democratic notions. Following this film, Chaplin and Goddard decided to go their separate ways, though they stayed good friends for the remainder of their lives. It would be seven years before the release of another Chaplin picture, largely because of a paternity suit brought on by a young New York girl that went by the name of Joan Barry. The suit, which garnered national attention, was a very difficult time for Chaplin and an interesting mystery that still brings questions up to this day. In 2009, I wrote a long form article on the entire Joan Barry situation that, as far as I have seen, is one of the most extensive recounts available. I spent months writing this piece and scoured newspapers, magazines, books, FBI records and the Internet, in addition to several personal interviews, including one from Joan Barry’s son from a later marriage and Richard Lamparski of Whatever Happened to.. fame. That article is available in its entirety on the blog main page here.